Welcome to the new Skimbaco Lifestyle! We integrated the entire Skimbaco blog network under the same site to offer you one stop destination to get inspiration to live life to the fullest. We hope to spread sunshine to your everyday life with ideas and stories that hopefully inspire you to take action and do something small – or big – to enjoy your life now. Skimbaco Lifestyle site now consists of over 2000 blog posts, and if you are already a subscriber, you’ve maybe noticed we also publish now more often. You can subscribe the entire Skimbaco Lifestyle RSS via feed readers, or subscribe only the topics you are interested in in a once a weekly email. Notice that if you subscribe the entire site, you will automatically get all of the posts, except Skimbaco Lifestyle Finnish Edition. Read more about the new Skimbaco Lifestyle online magazine and how you can get connected and possibly change your subscription preferences. Skimbaco is living life to the fullest right now. 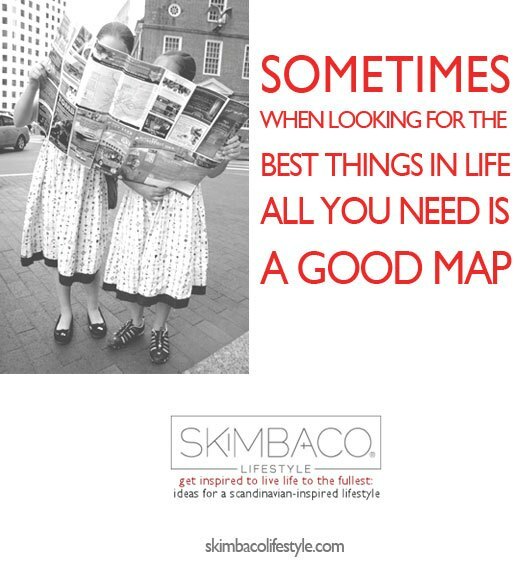 We all define SKIMBACO differently – to one it can be spending family time in a lovingly decorated home. To one it can be exploring the world as a nomad. We have gone from skiing in Colorado to shopping in New York and now traveling around Europe while living in Sweden – and everything in between in just the past 5 years of Skimbaco Lifestyle. While we admire the people who can pinpoint one thing in life that makes them the happiest, we believe that the happiest life includes several small and big things that make us happy. We encourage you to be adventurous, be inspired to live a little, and try new things in life – without forgetting what’s right in the front of you. Sometimes we just have to look to see the beauty in the front of us. Sometimes when looking for the best things in life all you need is a good map. Let us be your map. Skimbaco Fashion inspires you to love the way you look. Get Inspired for example features Live a Little series on Mondays. Just in! is stories hot off the press, what’s the topic that makes people talking right now. The Rich Life weekly column by Adrienne Shubin, ideas how to live your richest life on a budget and enjoy life in California. Skimbaco Family & Kids, stories from modern motherhood, and anything related to parenting. Skimbaco Shop features great products and stores helping you to find the latest and the greatest. DIY includes DIY projects and crafts, easy fixes and cheap decorating ideas. Decorating styles guides you with specific style or look. Rooms helps you to get ideas for your home, one room by the time. Entertaining offers tips and decorating ideas for home parties. Scandinavian design features the best from Scandinavia. What’s in now! features design and home trends, interviews etc. timely subjects. European Food Tour – eat with your eyes as we tour Europe. Recipes of simple, yet gourmet-inspired food. Drink – because we all need a cocktail every now and then. Seasonal food ideas offers ideas for the Holidays around the year. Parties gives you tools to entertain home. Family Travel includes traveling tips and stories from family perspective. Luxury Travel – because we all want the best. On a dime gives money saving tips because we all can’t afford the best. Destination Unknown is a weekly column by Satu Vänskä-Westgarth focusing on outdoor living and adventure travel. Travel Insight is a weekly column by Leigh Hines focusing on luxury travel and resorts and hotels. New this year: Skimbaco Man, content about men’s lifestyle and fashion. Monsieur Curations is a weekly column written by Wes Holland about men’s fashion. New to our blog network! We also added a small Skimbaco Lifestyle Finnish Edition for our readers in Finland. The Finnish Edition will include some same topics as the rest of the site, plus special features only for Finnish readers. Tyylitila is a weekly column by Nina Varis focusing on fashion. Love it Katja!!! What a perfect continuation of your vision!!! Thank you! So excited to have an amazing team working with me on this journey! Congrats Katja! It looks amazing.